Isaac Luria (1534 – July 25 1572), also known as the "Ari" (Hebrew: The lion), was a Jewish mystic of Safed, one of the four major cities of Palestine. A gifted mystic who developed a special system of Kabbalah, the Jewish esoteric tradition, his fame led to an influential kabbalistic school named after him. 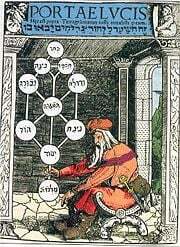 Lurianic Kabbalah was propounded especially by his disciple Hayyim Vital and contains a complex mystical theory of the creation of existence, its degeneration, and ultimate restoration. Luria is particularly known for his teaching of the ten "Sefirot" or "vessels" of divine light, some of which were broken at an early stage of the Creation, allowing the existence of sin and evil. In Luria's system, human beings are involved in a process redeeming not only themselves, but both the Universe and God, which will eventually be brought to completion by the arrival of the Messiah. His religious practice was highly mystical, involving both meditation and kabbalistic formulas, which he applied to all aspects of Jewish ritual and tradition. After his death, Luria's teachings gained widespread popularity among European Jewry. Although Lurianic kabbalism is generally rejected by mainstream Orthodox Judaism, it became the leading school of Jewish mysticism and is the basis for many of the basic beliefs of Hasidism. Critics, on the other hand, associate it with widespread Jewish superstition in the late Middle Ages, as well as the messianic fervor related to the many Jews accepting the seventeenth-century mystic Shabbetai Sevi as the Messiah. Luria's teachings have recently become popular among some Gentiles as well as Jews, as a result of interest arising from the culture of New Age mysticism. Isaac Luria was born in Jerusalem in 1534 to an Ashkenazi father (a German or Polish Jew) and a Sephardic mother (a Jewess of Iberian-North African descent). When his parents died while still a child, he moved to Cairo, Egypt, where he was raised by his rich uncle Mordecai Francis, a tax collector. His uncle provided him with the best Jewish teachers. Luria showed himself to be a diligent student of rabbinical literature; and, under the guidance of Rabbi Bezalel Ashkenazi (best known as the author of Shittah Mekubetzet), he became proficient in that branch of Jewish learning while quite young. At the age of 15, Luria married his well-to-do cousin, which enabled him to continue his studies. He soon turned to asceticism and mysticism. About the age of 22, he secluded himself entirely for seven years and became engrossed in the study of the Zohar, a major work of the Kabbalah which had recently been printed for the first time. He retreated to the banks of the Nile, living in an isolated cottage, giving himself up to meditation and prayer. He visited his family only on the Sabbath, speaking very seldom, and always in Hebrew. Through his deep life of prayer and meditation, he believed that he had frequent encounters with the prophet Elijah, who initiated him into the world of divine doctrines. Luria died at Safed, Ottoman Empire controlled Land of Israel, July 25, 1572 (5 Av 5332). He was buried in the Old Cemetery of Safed. 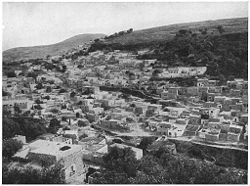 After the expulsion of the Jews from Spain in 1492, many prominent rabbis had relocated to Safed, which became the key center for Jewish mysticism or Kabbalah. In 1569, Luria moved back to Palestine. After a short stay in Jerusalem, where his new kabbalistic system seems to have met with little success, he moved north to Safed. There, he formed a small and exclusive circle of kabbalists to whom he imparted his doctrines, by means of which he hoped to establish a new moral system for the world. To this circle belonged Rabbi Moses ben Jacob Cordovero, Rabbi Shlomo Alkabetz, Rabbi Joseph Caro, Rabbi Moses Alshech, Rabbi Eliyahu de Vidas, Rabbi Joseph Hagiz, Rabbi Elisha Galadoa, and Rabbi Moses Bassola. The group met every Friday, and each confessed their sins to each other. Soon Luria had two classes of disciples: novices, to whom he expounded the elementary Kabbalah, and initiates, with whom he shared his secret teachings and meditation formulas of invocation and conjuration. The most renowned of the initiates was Rabbi Chaim Vital of Calabria, who, according to Luria, possessed a soul which had not been soiled by Adam's sin. In his company, Luria visited the supposed grave of the ancient Rabbi Shimon bar Yochai and of other eminent teachers. These graves were unmarked but were reportedly identified through Elijah's guidance. Luria's kabbalistic circle gradually widened and became a separate congregation, in which Luria's mystical doctrines became supreme. Luria introduced a unique way of living which included the observance of esoteric rituals and meditations, affecting the group's liturgy and rituals as well as private meditative practice. On the Sabbath, Luria dressed in white and wore a fourfold garment to signify the four letters of the Ineffable Name and the Lord God. Luria delivered his lectures extempore and wrote several works as well as some kabbalistic poems in Aramaic for the Sabbath. The main literary exponent of his kabbalistic system was Rabbi Hayyim Vital. Vital collected the notes of the lectures which Luria's disciples had made; and from these notes he produced numerous works, the most important of which was the eight volume Etz Chayim ("Tree of Life"). At first these writings circulated in manuscript copies. Each of Luria's disciples had to pledge himself, under the threat of excommunication, not to allow a copy to be made for a foreign country; so that for a time all the manuscripts remained in Palestine. Eventually, however, one was brought to Europe and was published at Zolkiev in 1772 by Isaac Satanow. In this work are expounded both the theoretical and the devotional or meditative Kabbalah based on the Zohar. 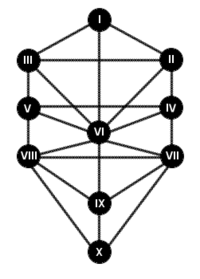 The ten "vessels" or Sefirot of the Lurianic "Tree of Life." In Luria's system of creation and restoration, the Infinite (called Ein Sof) compresses itself in order to make room for the creation. This occurs by means of a beam of light emanating from the Ein Sof into space. The divine light later comes to be enclosed in finite “vessels” (called Sefirot). Six of the ten Sefirot, however cannot contain the light and break under the strain. Through this event, disharmony and evil enter the world. The work of ridding the world of evil and restoring both history and the cosmos is known as tikkun. In the process, the divine sparks that were lost through the breaking of the vessels are also redeemed. The restoration of the primordial man, known as Adam Kadmon, is the product of this process, which simultaneously completes Divinity itself. Human beings play a central role in this process through various acts of prayer and mystical incantations geared to bringing about the original harmony and unity of the Universe. Much of this work of tikkun involves contemplation of the divine name of God. Unlike traditional Judaism, which generally rejects the notion of Original Sin, Luria's teachings suggest that something went wrong at the time of creation, which caused conflict, disharmony and evil to enter into the world. This state of confusion and conflict will cease with the arrival of the Messiah, who will establish a moral system for the world and will rebuild the "Adam Kadmon." Until that time comes, man's soul, because of its deficiencies, cannot return to its source, and has to wander through the bodies of men and of animals, and even through inanimate things such as wood, rivers, and stones. Luria thus developed the theory of the "impregnation" (ibbur) of souls, which teaches that if a basically pure soul neglected some religious or moral duties while on earth, it must return to earth and attach itself to the soul of a living person in order to make up for such neglect while on earth. In other words, departed souls, to expiate their sins and achieve spiritual growth, must return to the earth plane and work with the souls of living people to do good deeds. Luria also taught that humankind has the capacity to learn the true nature of each soul. This awareness is to be effected through secret meditation formulas and kabbalistic rituals. Luria also introduced his mystical system into Jewish religious ceremonies. Every commandment had for him a mystical meaning. The Sabbath with all its ceremonies is to be welcomed as bride and was looked upon as the embodiment of the divinity in temporal life. Every ceremony performed on that day was considered to have an influence upon the spiritual world. Every word, every syllable, of the prescribed prayers contained hidden names of God, upon which one should meditate devoutly while reciting. A medieval kabbalist contemplates the Sefirot. Luria's teachings became widely influential after his death. In the late middle ages, his tradition of mystical meditations and chants were often associated with "practical kabbalah," an attempt to change physical reality by means of chants and mystical invocations. Some commentators associate Lurianic tradition with widespread superstitions among the Jewish masses and with the messianic fervor that led to large numbers of Jews accepting Shabbetai Sevi as the Messiah in the seventeenth century and the later popularity of the antinomian movement of Jacob Frank. Although Luria's teachings have not been generally accepted by mainstream Judaism, the Lurianic Kabbala had great influence on later Jewish mysticism and on Hasidism. In reaction to earlier excesses, Kabbalah was taught only to a select few—namely, pious Jewish males over the age of 40 who had spent a lifetime immersed in the study of Hebrew texts. Its followers believed that understanding and mastering the kabbalistic teachings would bring one closer to God and allow greater insight into God's creation. In popular culture, Luria's teachings have found an audience among New Age Jews and Gentiles alike, as exemplified by a number of kabbalistic centers throughout the world. This page was last modified on 6 March 2018, at 19:40.